The original church building was destroyed by fire around sunrise the morning of September 6, 1917 when it was struck by lightning. The current building was constructed soon thereafter and dedicated on May 18, 1919. It has since been expanded and updated and still serves its members well to this day. Despite having a history closely tied to the church, the cemetery actually predates the United Brethren society there. At least three headstones can be found bearing dates before 1844. Tradition tells us that George R. Waltz gave the land for both the church and the cemetery. Waltz settled in Lafayette Township in the spring of 1836 and it is in February of that year for which we find the earliest known burial, that of Luther Doane. The Union Cemetery Association was formed by a group of citizens whose interest was the maintenance and upkeep of the cemetery. On April 11, 1874 the first meeting was held with George W. Waltz, John Traxler, and J.J. Lance chosen as officers. William A. Carlton was elected treasurer and John P. Waltz as secretary. John L. Waltz was elected to be sexton. Among the first orders of business was the renaming of the cemetery from Union Graveyard to Union Cemetery. It is not known what, if any, records were kept for the cemetery prior but in 1875 a new plat was drawn up for the grounds. The cemetery was restaked and a plat of sections made up with lot numbers assigned. Association minutes mostly detail the electing of officers and financial details but a few interesting tidbits can be found within the pages. Back in 1874 the cost for digging graves ranged from $2.50 to $3.00. By 1913 the price for digging graves was $6.00. Mention is made about the erection of a gate and the trimming of hedges. Most interesting is the reference in the minutes of the 1878 and 1879 meetings to the burning of rubbish on the grounds of a pottersfield. It is not known where on the grounds this `pottersfield’ was located although, ironically, in later years burning on the cemetery grounds was forbidden by Association rules. In 1883 a vacant lot in the cemetery could be purchased for $2.00. In 1892 mention is made of constructing a gravel walk from the church to the cemetery. Cemetery Association Meetings were held for many years in the new District No. 7 Schoolhouse which was located down the road a bit; east of the cemetery and church properties. This ended in 1917 when the association began meeting in the United Brethren Church. In 1925 we find the last reference made to the `Union Cemetery Association’ and by the time of the last meeting on June 6, 1937 the group refers to itself as the `Northwest Memorial Association’. The oldest section of the cemetery is the southernmost part and is 1.126 acres in size. It is divided up into six equal sections (numbered 1 through 6) with each comprised of twenty-two individual lots. Each lot is seven feet long and thirty feet wide; containing nine gravesites. Grave #1 is on the south end of each lot. Lot numbering for each section begins with Lot 1 on the east end and continues west to the back of the cemetery. This section contains a total of 132 burial lots. Lots 1 through 9 in Section 2 are only nineteen feet wide and contain only five gravesites due to a walkway measuring eleven feet wide and which passes through leading up to a flagpole. Between Sections 3 and 4 is a path measuring eleven feet in width and between each row is a three-foot walk. At the rear of the cemetery, on the west side, is another three-foot walkway. Some of the lots in Section 1 have gravesites eliminated by the dropping off of the hill leading down to the road. * – This is an error in the deed record. It should say `lot number ten’. As mentioned above, there was once a schoolhouse in the southeast corner of the old section of the cemetery. This piece of land was sold by George R. Waltz to the Directors of Lafayette School District No. 7 on April 12, 1841 for the sum of one dollar as recorded in Volume S, page 84 of the Medina County Land Records. “…the following described tract or lot of land situated in the township of Lafayette, a part of lot No. ten on what is commonly called Large Lot No. three, tract no. one (on the Mather tract) in Lafayette in the County and State aforesaid and on the Connecticut Western Reserve and bounded as follows: Beginning at a stake forty-four and one half rods from the southeast corner of said lot no. ten; thence north five rods; thence west parallel to the road three rods; thence south five rods; thence east three rods to the place of beginning containing fifteen (15) square rods (the above includes one half the road). 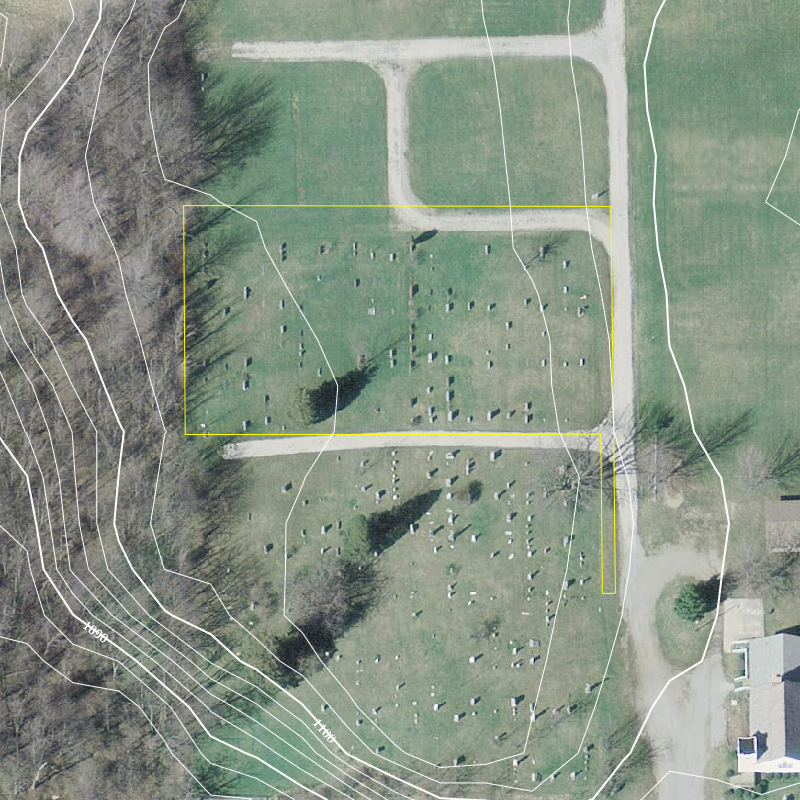 As seen on the cemetery maps, this small lot contained what would become the first five lots in sections 1 and 2. Once vacated by the school, the area was used as part of the cemetery. When the school ceased to be on the lot is unclear although land records show that Isaac Peter Backes, et al. deeded a half-acre lot in Lot 15 to the Board of Education on September 23, 1861. That lot would be the new site of the schoolhouse; located just down the road to the east. The earliest burial known to have been made in the vacated area was that of Jesse Enos in September of 1878. Curiously, the southwest corner of the cemetery has neither a single headstone nor any known graves. The earliest known map of the cemetery – drawn up by the Union Cemetery Association around 1880 – shows all twelve lots in that corner of the cemetery as unsold. 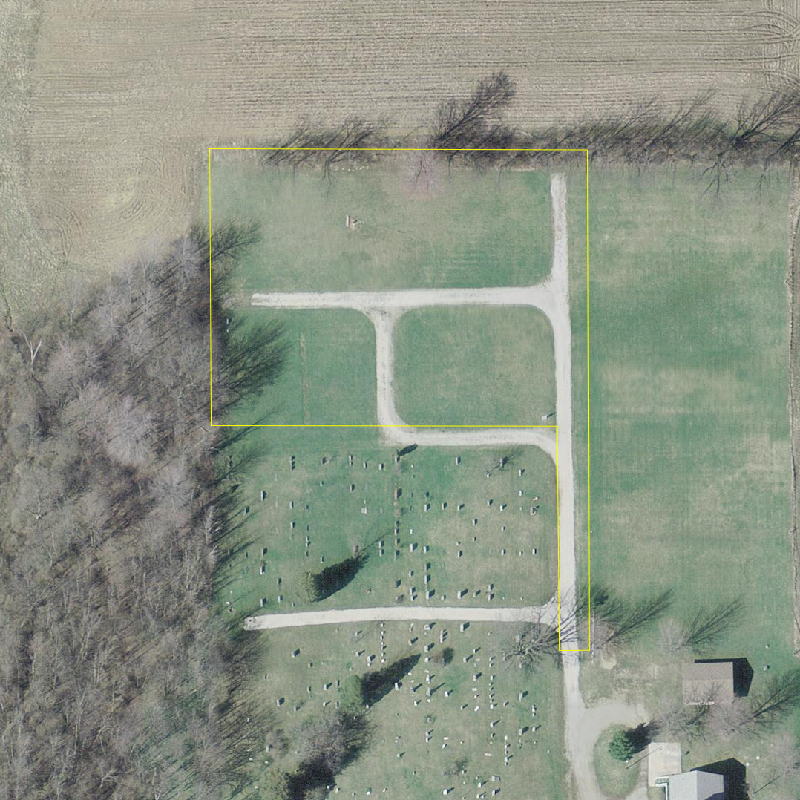 This is the only part of the cemetery where this occurs and it is this way on all subsequent maps. It is possible that this area of the cemetery was avoided due to its sitting lower than the rest of the grounds. When the Cemetery Association was formed and the first map drawn up, there no doubt would have been people still living and/or their relatives who could have relayed information about any old burials made in that area. Nine lots in the older section are marked simply as `Occupied’ in sexton’s records. Of those nine, five have no graves for which any identities are known. The other four have graves marked by headstones. A possibility is that the `pottersfield’ referred to in the Cemetery Association minutes can be accounted for by one or more of these `Occupied’ lots or that it is the actual use of the conspicuously empty southwest corner. The middle section of the cemetery is 0.6861 acre in size. It is divided up into four sections (known as Section 7, 8, 9, and 10) with each comprised of twenty-one individual lots. The lots were laid out as in the older section; being seven feet long and thirty feet wide but only setup for six gravesites each. Section 10 is not like the others; being only 13.75 feet wide and with lots setup for only three gravesites each. Current cemetery records now letter the gravesites with Grave A being on the south end of each lot. Lot numbering is the same as in the previous six sections. This section contains a total of 84 burial lots. As in the older sections, there is a three-foot walkway between each row and a three-foot walk at the rear of the cemetery on the west end. A driveway runs east-west separating this part of the cemetery from the old section. It was originally laid out to run around the entire perimeter of this addition but those parts at the west end and northwest edge are not currently used. At the time it was laid out, this driveway measured thirteen feet wide on the south side, 11.5 feet wide on the west, ten feet wide on the north, and eleven feet wide on the east side. This piece of land was purchased by the Cemetery Trustees on October 21, 1911 for the sum of eighty-five dollars from J.T. and Martha Norris as recorded in Volume 84, page 343 of the Medina County Land Records. It is divided up into three sections (known as Sections 11, 12, and 13). Lots in these sections measure nine feet long by sixteen feet wide; each containing four gravesites. Gravesites are lettered with Grave A on the south end of each lot. Sections 11 and 12 are each made up of thirty-two individual lots; laid out in eight rows of four lots per row. Section 13 is comprised of seventy-two individual lots laid out in eighteen rows of four lots per row. Lot numbering for each of these sections begins with the lot in the southeast corner – known as Lot 1 – and proceeds north to the end of each row whereupon it turns west to the next row and runs back south. This pattern continues as you move westerly through the section. A twelve-foot wide driveway runs through the center of the parcel in a `P’ shape and separates each section. Unlike the other parcels, lots in these sections are separated from each other by a three-foot wide walkway as well as one between each row. 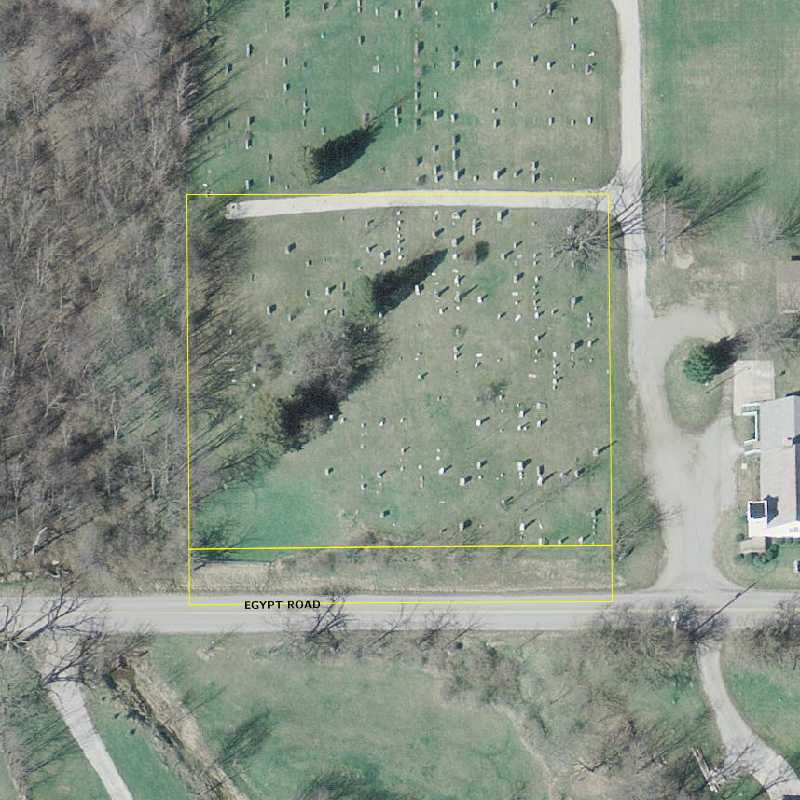 Pursuant to Section 517.10 of the Ohio Revised Code, the Township of Lafayette was granted legal title to the two original cemetery parcels on January 28, 1997 as recorded in Volume 1271, page 832 of the Medina County Land Records. The township has a complete copy of the Union Cemetery Association minutes. Although these records do contain maps showing the cemetery layout and some lot sales, there is almost nothing relating to actual individuals buried. The township has virtually no original burial records for the older section. A map with names and dates jotted on a map shows most, but not all, of the burials made in the middle section. There are inconsistencies in the records for that section where the stones of married couples face different directions. In those cases, the individual grave designations might be reversed. A WPA map was done for the cemetery though it contains a number of mistakes. The WPA’s individual grave designations for the old section have been included here given the absence of other cemetery records for that section. Township cemetery records viewed were current through February of 2006; some information obtained afterwards has been included. The burial listings for this cemetery were compiled from reading the tombstones, obituaries, death records, and supplemented by the township records.